The high-top cargo vans such as the Ram ProMaster, Mercedes Sprinter, Ford Transit, and Nissan NV are seen on the roads everywhere you look. I was behind one the other day, and boxes were piled on the floor rising up beyond the windows. 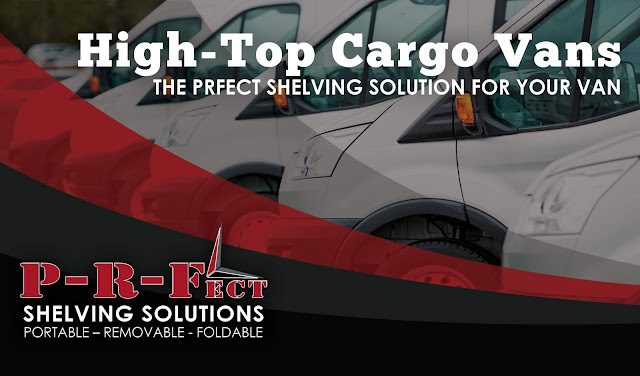 PRF Shelving Solutions has perfect portable truck shelving for high-top cargo vans. They are produced in 4 foot sections and are 18 inches deep. PRF supplies shelving in sections, giving the client the flexibility to partially equip cargo vans with shelving or cargo space with shelving. See PRF’s latest video demonstrating the high-top van portable shelving systems here.